Very spacious 2 bedroom 2 bathroom duplex apartment for sale in Ovacik in a great location. The Royal Hills apartments are located in the hillside of Ovacık with amazing views over the whole valley. 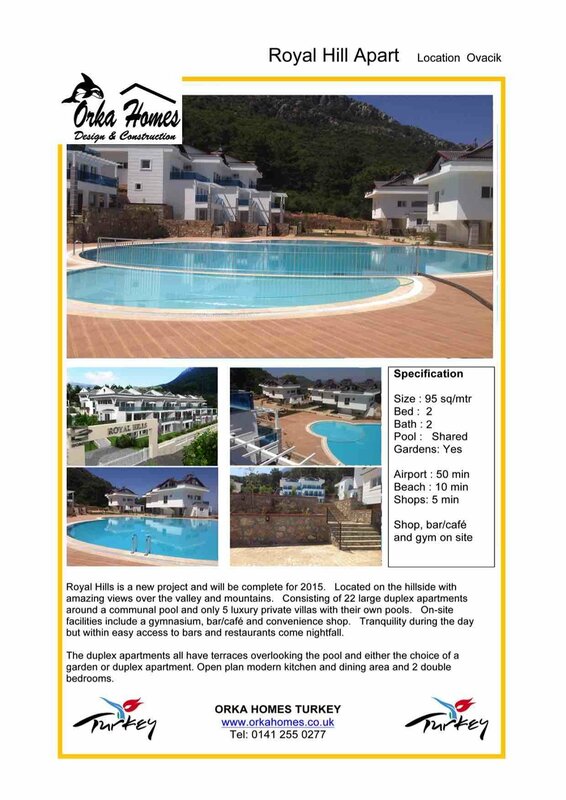 This project has 22 large duplex apartments sharing a large swimming pool with separate childrens pool. On this small complex there is a small bar/cafe and gymnasium and plenty of sunbathing areas around the pool and gardens. Each apartment is built over 2 levels with the lounge, kitchen and dining area on th lower floor and the bedrooms on the upper. There ia a large terrace/balcony on the upper apartment while the lower apartment has a small garden area. This exclusive development is in a truly tranquil area surrounded by natural beauty. People staying at the Royal Hills will of course also be able to enjoy all the other facilities that Orka offer and there is free bus service between the apartments and the Orka hotels. Each villa and apartment has several balconies and terraces to enjoy the spectacular panoramic views.